The sections below provide guidance on how to create and manage tax rules. 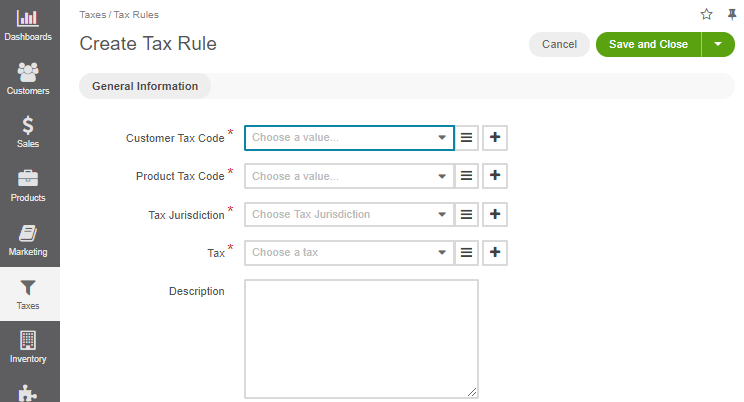 To view all tax rules, navigate to Taxes > Tax Rules in the main menu. CUSTOMER TAX CODE The unique identifier of the customer tax code. PRODUCT TAX CODE The unique identifier of the product tax code. TAX JURISDICTION The unique identifier of the tax jurisdiction. TAX The unique identifier of the tax rate. DESCRIPTION Detailed description of the tax rule. CREATED AT Date when the tax rule was created. UPDATED AT Date when the tax rule was updated last. View Tax Rule details — Click on the item to open its details page. 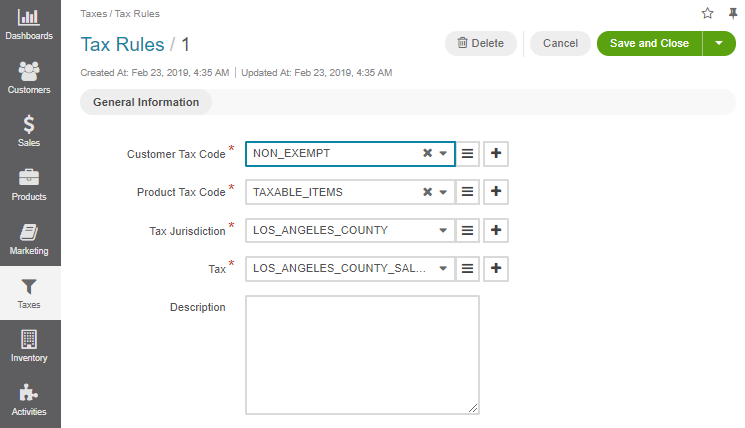 Edit Tax Rule details — Hover over the More Options menu to the right of the item and click to start editing its details. Delete a Tax Rule: Hover over the More Options menu to the right of the item and click to remove the Tax Rule. Navigate to Taxes > Tax Rules in the main menu. Find the line with the necessary tax rule and click on it. Edit tax rule details by clicking Edit to the top right of the page. Delete a tax rule by clicking Delete to the top right of the page. Update the links between the tax rule and the tax rule components (a tax rate, a tax jurisdiction, a customer tax code, and a product tax code) to modify the tax rule. You can export the tax rule details in the .csv format following the Exporting Bulk Items guide. Import File option helps import a large bulk of tax rules information into the tax rules list using the .csv file. In the main menu, navigate to Taxes > Tax Rules. The tax rule list opens. Prepare data for import: Create your bulk information in the .csv format. Once your file is ready, click Choose File, select the prepared comma-separated values (.csv) file, and click Import File.